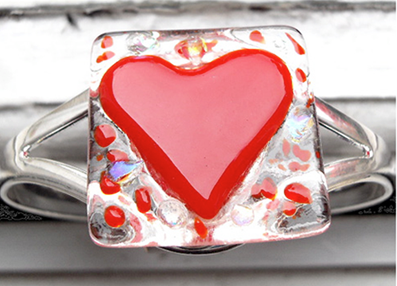 The clear glass piece is 3cm x 3cm and the opaque Red heart is 2.5cm x 2.5cm. These two layers of glass are both fused together. There are also small accents of Red and Dichroic glass. The bangle is very good quality plated silver and is adjustable so will fit most wrists. It comes in a silver card bangle gift box.